Dr. Dan Penny, Chief of Pediatric Cardiology, Texas Children's Hospital. "Children Get Broken Hearts Too." Dr. Penny grew up in Cork, Ireland and went to Medical Schoolat University College Cork. As is common in Europe, this course commences after high school. During his medical course, he took time out to complete an intercalated BSc degree in Physiology for which he was awarded a First Class Honors. He finished his MB, BCh, BAO degree (medical graduation), obtaining honors in Medicine and Surgery and completed his house office position at Cork University Hospital. He then went to Dublinto train in pediatrics and neonatology. In London, he trained in Pediatric Cardiology at The Royal Brompton Hospital and while there completed his first research doctorate on the Physiology of The Fontan Operation. Having decided to undertake further training for childhood heart disease, he traveled to Melbourne, Australia , which at the time had the best outcomes in the World. He completed a fellowship in Pediatric Cardiology and decided to complete a further research doctorate in laboratory physiology. 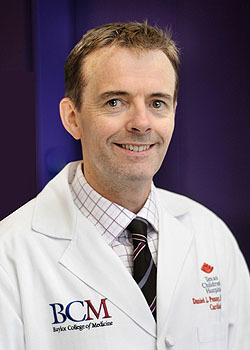 Melbourneas The Chief of Cardiology at The Royal Children’s Hospital and as a full Professor in The University of Melbourne. In 2010 he moved to Baylor College of Medicine as a Professor of Pediatrics and Chief of Cardiology at Texas Children’s Hospital.